It really all comes down to this–God became man and showed us how to live. Then he showed us how to die. His sacrifice changed the world–and it changed me. No matter what I gain, what I lose or what circumstance may occur in my life, at the end of each day that old rugged cross still remains the emblem of victory for us in the amazing journey. I am so grateful that God loved me and that he was willing to be that sacrifice for me ad for you. On this weekend, when we celebrate the death burial and Resurrection of our Lord my prayer is that I cling to the old rugged cross and that I exchange it one day for that crown. How much of your faith is lip service and human rules? As Christians, when we evaluate our relationship with God, this is the tough question to ask. It is so easy to begin to slip into a rule based walk with God. Don’t eat this, drink that, watch that or be seen there–causes such a stir among the family. Clearly we have to guard our hearts and minds in Christ Jesus. Truly when we walk, we need to do so in a way that honors him. But when the things we do and don’t do become more important than simply walking with and following his lead—we struggle with selfish Pride and self righteousness. Christians can often represent a huge threat to bringing folk to Christ. If they focus on their religious activity more than their relationship with God and others—like the Pharisees, they push folks from the God they serve. This Easter, lets walk in a way that is substantive not based on lip service and human rules!!! If we are looking for the one miracle that will convince us—we will never follow. They didn’t then and we won’t now. If we look for the leadership of a God that always keeps his word, we will find him AND see some pretty amazing stuff to boot. 25 Shortly before dawn Jesus went out to them, walking on the lake. 26 When the disciples saw him walking on the lake, they were terrified. “It’s a ghost,” they said, and cried out in fear.27 But Jesus immediately said to them: “Take courage! It is I. Don’t be afraid.” 28 “Lord, if it’s you,” Peter replied, “tell me to come to you on the water.”29 “Come,” he said. It does not take much faith for God to do amazing things. One need simply to be available and believe. Of all his miracles, Jesus feeding the huge crowd is a great picture of how he provides completely and through the most amazing means. 5 loaves, 2 fish and an expecting crowd allowed God to show that he owns the world and everything in it. When the crowds were filled—there was still sufficient food remaining to fill 12 more baskets. God always does exceedingly and amazingly more than we could ever expect. In our lives, we too need to look for God’s provision. We need to walk expecting for God to provide. We need not try to understand the why’s but simply expect God to always keep his word and execute the plan. We need to trust Him and follow him humbly and expectantly. We need to live as a grateful servant and child. We do not have a mentality that feel we deserve to be pampered, but we do walk believing God will meet ou needs as we follow him. We are not entitled—but we are loved. Help me Lord to follow you humbly and trust you fully. Hearing of this, the crowds followed him on foot from the towns. 14 When Jesus landed and saw a large crowd, he had compassion on them and healed their sick. 15 As evening approached, the disciples came to him and said, “This is a remote place, and it’s already getting late. Send the crowds away, so they can go to the villages and buy themselves some food.”16 Jesus replied, “They do not need to go away. You give them something to eat.”17 “We have here only five loaves of bread and two fish,” they answered. Inevitably, there can be no separation between us and the world. No matter how careful we are to walk according to his teaching, the world ends up mixed in our lives. The parable speaks of how the enemy sprinkled weeds in the wheat. It threw the farm hands into a worried mess. How would the wheat ever grow and be harvestable with weds sprinkled in? The Farmer had a great answer—let them grow up together—then at harvest time, we will remove the weeds first and then harvest the wheat. What a novel approach—remove the hindrance and allow the wheat to continue to grow. That is what God wants for our lives as well. He wants us to recognize we are growing in the midst of a culture of weeds. All through our lives, they attempt to squeeze and render us ineffective. As we grow and become ready for harvest and use, we also need to separate the weeds in our lives and enjoy the soil of his word and prayer. That separation also grants us the freedom to submit and follow him closely. As we do—he protects, provides and prepares us for an eternity of peace and joy. We would be unable to concentrate on that if we had to spend our energy fighting the weeds. Be patient and be ready to be separate from the world even while we are in its midst. Help me Lord, to follow humbly and closely as you eliminate the weeds in my life. 24 Jesus told them another parable: “The kingdom of heaven is like a man who sowed good seed in his field. 25 But while everyone was sleeping, his enemy came and sowed weeds among the wheat, and went away. 26 When the wheat sprouted and formed heads, then the weeds also appeared. 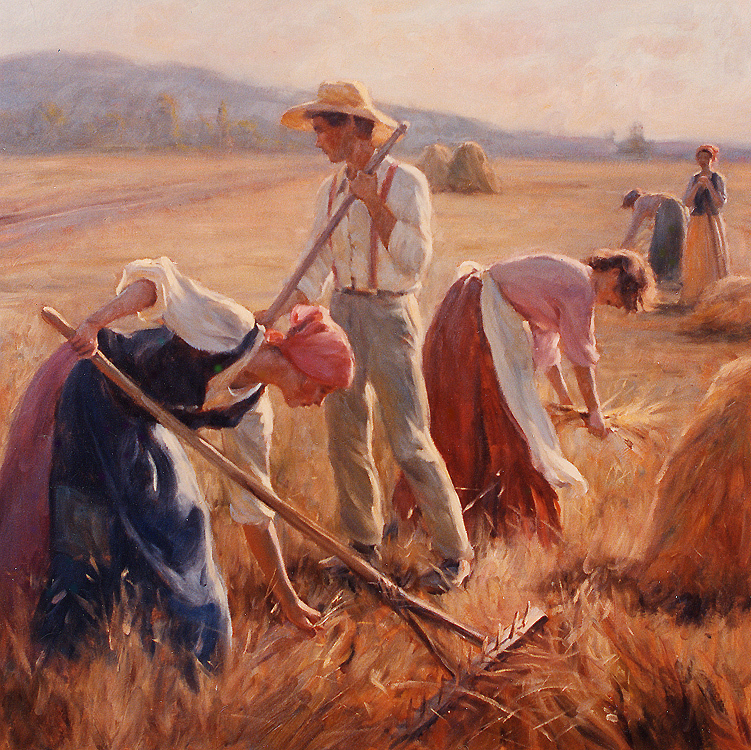 27 “The owner’s servants came to him and said, ‘Sir, didn’t you sow good seed in your field? Where then did the weeds come from?’ 28 “‘An enemy did this,’ he replied. In two thousand years little has changed. The parable of the sower reminds us that while the message does not change, the impact it has varies greatly depending on the person and the circumstance. Some people hear the message and ignore it—the seed along the road, they are never impacted at all. Some people hear the message it impacts them—the shallow soil, but because they have no depth of character or commitment, it soon fades away and they return to the former state. Some hear the message and it takes root and they begin to grow, BUT—the thorny seed—they are among the folks that would lead them away from Christ and the association ultimately leaves them unusable and fruitless. Finally, some hear the message and they are transformed—the good soil—and they spend the rest of their life growing, sharing and helping others to enjoy freedom. The harvest varies among them, but, it is a life of joy and abundance. Jesus wanted us to understand the message does not change—it is a message of hope and freedom. Throughout history, it has impacted lives from every nation, class and life stage. Its impact has varied based on the heart of the person receiving it. We as sowers, share the message with love and work to see it land among those with desire, depth and direction. The Holy Spirit does the work, we simply remain faithful and share often. Help me Lord, to share your message humbly and with the love you intended. In spiritual warfare there are no spectators. The culture, the enemy and the Lord require that each person choose whom they will serve. When claiming the promised Land, Joshua explained that to Israel—“Choose this day whom you will serve,… as for me and my house we will serve the Lord.” Joshua 24:15 In t, life of Jesus, for a period he was a rock star. Thousands just came to see, eat and be healed. But, he did make it clear that the people did have to make a choice. Not a choice to follow him or to worship him, but a choice to Worship the father.